High-octane alt-country, Austin's Back Porch Mary lay both on pretty thick, writing rambunctious hillbilly songs about getting drunk, losing the girl, and getting thrown in jail. This is blue collar, drinking man's music to get tanked to or to blast and forget all your worries. Carelessness, anxiousness, and hyperactive, Back Porch Mary contain all the bad traits that make rock 'n' roll so damn fun, and so damn good. 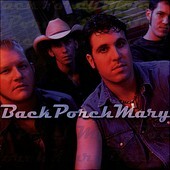 Back Porch Mary is a drunken stupor of a rock 'n' roll album and is quite proud being such! I'll give it a B.